So here it is my trip report for my trip to the Northwest Miramichi River in search of salmon. This was published in the July 15th edition of the Kings County Record, but I've added some photos and a short video here. I'm still working on a Youtube video :) Enjoy. Our first casts on the Northwest Miramichi. Kris Fuller and Dan Reicker try their luck. The sky was gray and damp but the rain hadn't yet started. I glanced quickly at the weather forecast as I finished packing my gear and it was calling for rain for most of the weekend. It didn't matter because I was too excited to let a little rain get me down. The boys pulled into the yard and we loaded up the truck and hit the road, bound for the Miramichi, in search of Atlantic salmon. The drive is a bit of a blur, mixed with wild conversation, laughter, and anticipation. By the time we reached the Fraser Burchill Road we were well ahead of schedule and decided to go in a little early and see if we could at least set up camp. We were happy to find the camp empty when we arrived and even more happy to see the River less than 20m from the front door. We resisted the urge to hit the river right away and instead made a good lunch with the anticipation that it would likely be a late supper. By 2:00 we couldn't wait any longer and a couple of us hit the camp pool while a couple moved down stream. I opted to move down river and explore my surroundings while I fished. This section of the Northwest Miramichi was relatively flat but the spruce covered hills that formed the valley were relatively steep and with the low lying clouds the whole scene seemed somewhat heaven like. Before I was able to take in all my surroundings, my trip was "made" when a large salmon leaped a full foot and a half out of the water right in front of me. At that moment I thought it wouldn't matter if I caught a salmon or not. That would change later. I continued to fish downstream and my first fish landed on the Miramichi would turn out to be a small brook trout. I was on my own at the time as I had wandered further down than I had realized. It was nearing supper time and I decided to go back up river and meet up with the boys and see how they had made out. That evening I hung closer to the camp pool and bridge pool where I had seen salmon rising earlier in the day. As the evening wore on I still hadn't even hooked a salmon while a couple of the guys had. I changed my fly a couple of times with no luck. Then I went to a pattern I didn't know the name of that was given to me by Mike Bailey. I was loosing confidence in my presentation techniques when two salmon jumped in front of me. Two of us were in the pool and we took turns casting, on about my third opportunity I felt a light hit but didn't set the hook and was sure I had missed my chance. I placed the next cast in the same location as the previous one and was surprised when the reel whizzed when a large salmon destroyed the fly. I set the hook and then it was on; the fish ran downstream hard and fast and I was hollering like a school girl. I focused on keeping the line taut and didn't force the fight. I let the fish feel like he was in control and when I felt he ran down far enough; I put the pressure on him. It was then that he jumped and I got my first look at my foe and my holler raised another octave. I had a big fish on. I had a broad smile after landing my first, hopefully not my last, Atlantic salmon. From this point my line got tangled in my reel and Kris Fuller aided me in getting it straightened out and I realized that fighting an Atlantic salmon is a two man task. Don Dow and Dan Reicker took photos and video as the “leaper” showed off twice more before taking a short run upstream towards me. I made good ground on him then and he was now in shallower water but not yet ready to give up. It took us three attempts before we got it in the net but once he was there, I let out a whoop. It was a battle that had lasted a little more than 10 minutes on an 8lb leader that ended just after 9:00pm. I landed a 32-34” salmon that likely weighed over 15lbs and then I was happy to let him go. Kris Fuller landed a 23" grilse that was very scared of the net. The rest of the weekend we all tried to duplicate the moment but landed only one other fish. It was a great weekend and we were sad to leave when the sun broke for the first time Sunday at noon. It was a great weekend and one I would love to do again. If you have ever thought of trying to battle a salmon I encourage you to take the leap. You won’t be disappointed. Don Dow hooked into a fish at the American Pool but was unable to land it. Dan Reicker played this Atlantic salmon just a little to long but was all smiles while the battle went down. 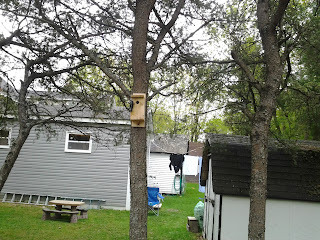 We placed this bird box early in the spring and this wood pecker keeps knocking on the door but no one is home yet. It has been awhile since I updated you on the progress of our garden, to be honest, it's been awhile since I've posted anything at all. I have lots to write about but I need to find the time to put it all on paper, or I guess more appropriately, on the laptop. 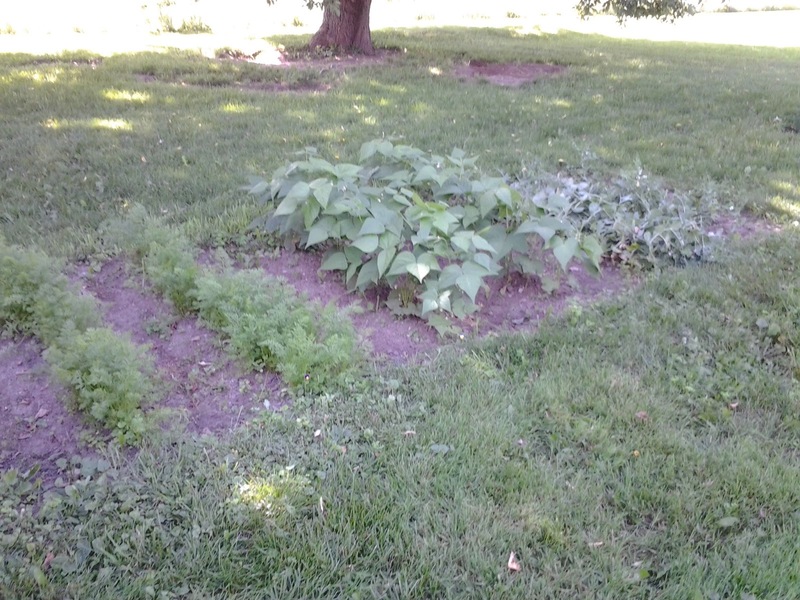 Our garden has suffered as well from a lack of attention due to the busy schedule but despite some weeds, the carrots, beans, and peas are all coming along nicely. In fact we have been eating some peas already and if the kids keep it up, we may not get any peas to the table. Whether they get to the table or not, the kids have seen that cycle of how things grow, and that was one of the key reasons for starting a garden. Yesterday evening as I was cleaning off a slip and slide the kids each raided the peas and my son proudly showed off how big the peas in his pod were. There are also beans hanging now but they will take a few more days before they are ready for harvest and the carrots are in a similar situation. I actually need to thin the carrots out some to foster larger growth from them. Surprisingly we haven't had to many wildlife grazers and I thank the dog for that. So here is what the garden is looking like. Small but growing and with our success so far, next year maybe bigger.